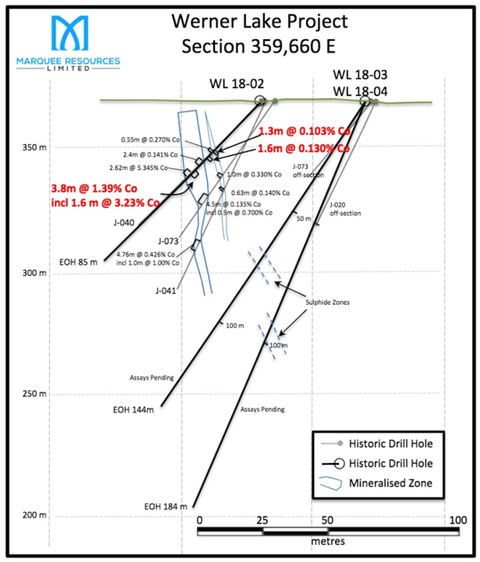 Marquee Resources Limited (ASX:MQR) today announced it has received assay results from the first two drill holes at its newly acquired interests in the Werner Lake Cobalt project, located in Ontario, Canada. The company has now completed eight holes for 1,527 metres at the Werner Lake Project as part of its phase one drilling campaign. Assays for two further drill holes are anticipated shortly. MQR intersected high-grade cobalt mineralisation in its first two drill holes at Werner Lake, including: 3.8m at 1.39% cobalt including 1.6m at 3.23% cobalt, from 36.7m (WL 18-02). The company is confident the assays received from this drilling campaign will enable it to increase the existing NI 43-101 Resource of 79,400 Tonnes at 0.43% cobalt. Assays from the first two holes demonstrate consistency of data from previous drill campaigns at Werner Lake where historical mine production was reported of 143,386 lbs of cobalt grading approximately 2.2% cobalt and 0.75 % copper. The company’s current exploration drilling campaign at Werner Lake is primarily focused on narrow spaced drilling, which is specifically intended to increase the existing Indicated NI 43-101 Mineral Resource of 79,400 Tonnes at 0.43% cobalt. This mineralisation remains open in all directions. 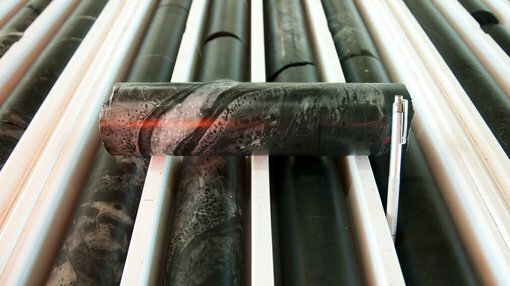 MQR has sent the drill core to a laboratory in batches and will be announcing assay results to the market as they are received. The next anticipated assays are expected to include WL 18-03 and WL 18-04 in the coming weeks. Marquee Managing Director Charles Thomas commented: “These early results from the first phase of the drill campaign are extremely exciting for Marquee and its shareholders and confirm the presence of a high-grade cobalt deposit at Werner Lake. “As we continue to receive results from this drill campaign we are expanding our knowledge of this high-grade deposit, which still remains open in all directions. It should be noted here that MQR remains a speculative stock and investors should seek professional financial advice if considering this stock for their portfolio. WL 18-02 returned a high-grade intercept of 1.39% cobalt over 3.8m (from 35.75m downhole), including 3.23% cobalt over 1.6m. This hole was drilled to test a previous area of high-grade cobalt mineralisation as defined in J-040 by Canmine Resources historic drilling undertaken circa 1995. That hole intersected high-grade cobalt mineralisation returning a main intercept of 5.345% cobalt over 2.62m. WL 18-02 successfully intercepted the same mineralised horizon as in J-040. Two other zones of mineralisation were also encountered in WL 18-02 that roughly correspond to findings in J-040. Overall a wide zone of copper mineralisation from 24.0m (12.1m at 0.26% copper) defined the targeted horizons. Cross Section 359,660 E, Werner Lake Drill Holes WL 18-02, 18-03 and 18-04. Drill hole WL18-01 was drilled to test potential down dip extension of mineralisation on Section 359,580 E. Mineralised units were encountered from 146.3 to 153.7 metres with overall sulphides <1%. The results, including 1.2m at 0.012% cobalt, from 147.3m, indicates the target horizon was intersected where projected and suggests an approximate extension of 40 metres to depth. 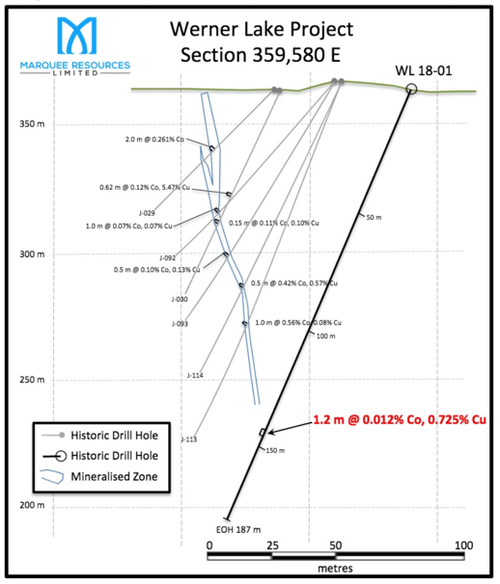 As the company expected, elevated copper values from 146.3m downhole (2.2m at 0.46% copper) also defined the targeted horizon in WL 18-01. Werner Lake Cross Section 359,580 E, Werner Lake Drill Hole WL-18-01.